What are your orthodontic options in Weatherford? The American Association of Orthodontists says straight teeth are a personal asset. Plus, good teeth ward off problems with speech, eating, gum disease, TMJ dysfunction and tooth decay. So, if you or a loved one face a crooked smile every time you look in the mirror, take heart. Dr. Deborah A. Romack and Dr. Garrett Mulkey, Weatherford dentists, offer traditional braces and Invisalign clear aligners to treat your individual smile issues. Dr. Romack is a member of the International Association of Orthodontics and the American Academy of Functional Orthodontics. As such, she has an intense interest and specialized skills that allow her to set smiles straight and beautiful. A new smile starts with an orthodontic evaluation at Cosmetic & Family Dentistry. The Weatherford dentist inspects the mouth, noting the position, number and condition of the teeth and how they bite together. With kids and teens, the dentist wants to know what teeth have already erupted and what their relationship is to each other is within the jaw bone. She also evaluates facial symmetry and how the jaw joint opens and closes. For children, the dentist addresses orthodontic needs with traditional metal bracket or wire braces. This tried and true system moves teeth into healthier and more attractive positions in 2 to 3 years, depending on the complexity of the case. Sometimes, the dentist avoids more extensive treatment when orthodontic care starts early. Using the principles of interceptive care, Dr. Romack can move teeth more easily and quickly while the bone structure of a very young face is still developing. 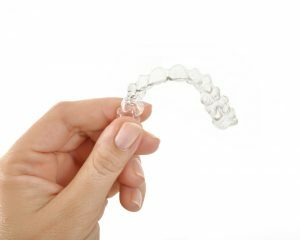 Older teens and adults benefit from traditional braces, too, but frequently, their mild to moderate issues may be treated with Invisalign clear aligners. Made from BPA-free acrylic and fully removable for cleaning, eating and special occasions, Invisalign appliances move teeth in as little as 9 months, with average treatment time being 12 months. Adults and teens like Invisalign because they can be remove the appliances but also because they are discreet. The 18-30 pairs of customized aligners are practically invisible, avoiding the embarrassment of typical “metal mouth” braces. Oral hygiene is super easy, and there are no sore spots common to metal braces. Whether metal or clear, your Weatherford dentist at Cosmetic & Family Dentistry can help you decide the right course of treatment. Contact the office staff today for an orthodontic consultation for you or your child. Ask about our $300 off special. Comments Off on What are your orthodontic options in Weatherford?